Jostedalen is a small village in the middle of nature, between mountains and glaciers. East of Jostedalsbreen and to the North of the innermost part of Sognefjord you can eat and sleep well, in close proximity to the activities on offer and right in the middle of amazing glacial landscapes, Summer and Winter. You will find accommodation and a cafe/restaurant in Gjerde, 30km from Sognefjord, at the Jostedal Hotel and Jostedal Camping. Gjerde is the perfect place to start your mountain trips and rafting down the Jostedøla (river) and there is also a shop and petrol station here. 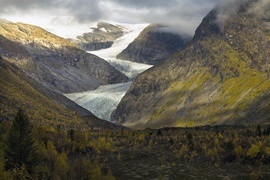 A few km further up the road you find the Nigardsbreen Camping, near to the Breheimsenter & Nigardsbreen.